A few years ago, you had a run-in with an almond that was harder than you expected – the superfood won and you ended up losing a tooth on the side of your mouth. Since you didn’t have insurance at the time, and you didn’t want to get a partial denture anyway, you dealt with the missing tooth as best as you could. Now, you’re considering dental implants in Larchmont Village, but you’re not completely sure how the process works. Luckily for you, the trusted experts at Geller Dentistry share the answers you need when it comes to replacing one, two or 10 missing teeth with implants. The titanium implant post will be surgically placed in your jaw, ensuring a secure foundation for the rest of the replacement tooth. You’ll need time to heal and to allow for your jawbone to fuse with the artificial tooth root during a process called osseointegration. Generally, this takes about 3-6 months. The dental crown, which looks and functions like the rest of your teeth, will then be secured to the abutment. You can say goodbye to the gaps in your smile at this point, since the process will be complete. Jawbone Strength – Dental implants actually increase the density of the jawbone, rather than causing it to wear away like dentures and bridges do. 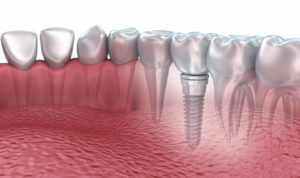 Longevity – Dental implants last longer than traditional dentures and dental bridges. Appearance – These replacement teeth will blend right in with your existing dentitions – no one will ever be able to tell that you have a false tooth. Cost – Although other prosthetic teeth options may be less expensive for up-front costs, dental implants actually save you money over the course of a lifetime, since you’ll rarely need to replace an implant. Stay-Put Smile – You’ll be able to speak, chew, and even kiss without embarrassing slipping and sliding from dentures. You’ll never have to worry about messy dental adhesive, restricting foods from your diet, or putting your teeth in a cup at night. Now that you know what to expect for dental implants and how they can benefit you, schedule your appointment with Geller Dentistry and make your smile radiant again!